Mix a light application of a balanced organic fertilizer into the soil prior to planting. In early summer, drench plants with a liquid fertilizer to prolong bloom time. Before planting sweet pea seeds, nick the outer seed coat with nail clippers to help speed germination. 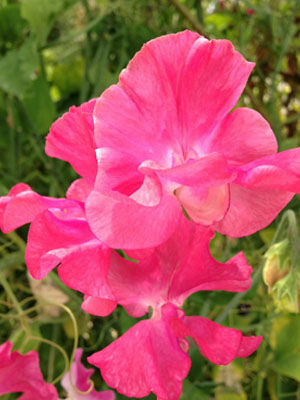 Plant sweet peas in the fall in mild winter climates, or first thing in spring in other areas. Sweet peas are a beautiful way to cover a chain link fence. Some varieties are much more fragrant than others. Colors include pink, white, red, purple, burgundy and many bicolors.